"PSG Developments Limited is committed to a partnership with our staff to improve the health, safety & welfare of every employee". PSG Developments Limited is determined to secure the highest levels of health, safety & welfare for our employees and anyone affected by our work. Through our business it is recognised that legislative and legal requirements represent minimum levels and the company will always strive to achieve the best possible standards. The company recognises that accident, ill health and near misses can occur as a result of inconsistency or breakdown in management controls. For this reason we are committed to continous review, development and improvement of the Health & Safety Management System. The company is further committed to establishing a "blame free" culture that promotes transparency and ownership of safety in our work. All employees are encouraged to report health & safety concerns to the directors and can expect them to be dealt with expediently and effeciently. PSG Developments Limited actively seeks the participation of all employees, contractors, and visitors to the premises to co-operate in achieving a safe and healthy working environment. Each employee is responsible for ensuring that this policy is adopted for his/ her area of work. People are valued as the key resource within this organisation and protecting the health and safety of our staff is acknowledged as a cost effective strategy that enables us to provide the highest standards of service to our customers. The company adopts the "Safe Person" concept to ensure employee, contractor and visitor safety at all times. Comprehensive and effective risk assessment. Safe systems of work, monitoring and review. Effective information and instruction and training where necessary. A safe environment in which the Health, Safety and Welfare of employees is paramount. The company will consistently provide effective communication of all health & Safety matters to every employee. 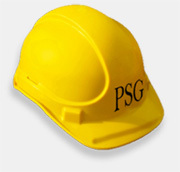 All PSG Developments employees are CSCS registered card holders.